I truly am so in love with this painting. It was Guided through meditation. 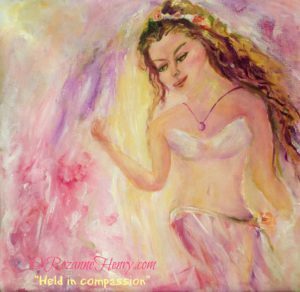 I connected to the essence of deep compassion all the time while creating her and felt it so strongly. I felt it for every woman needing to receive this essence. I felt it for myself too. The intention was to elevate her sense of worthiness and craft a new story of beauty for herself. But first … compassion and grace for the “old her” must always be first received. The old her that did not always feel worthy of beautiful experiences. Compassion is medicine for these parts of ourselves. She is number 37/100 #expressionsoflove – a personal painting project I am currently doing. “Held in compassion” has been SOLD. It has found a home here in Cape Town and is dearly loved by its new owner. She bought it as a self love gift and will be using it to hang in a space where she can revel in some feminine energy for herself.
. You can also request having a journal created for yourself with this image on the cover. I will be listing prints of this original oil painting for you too.